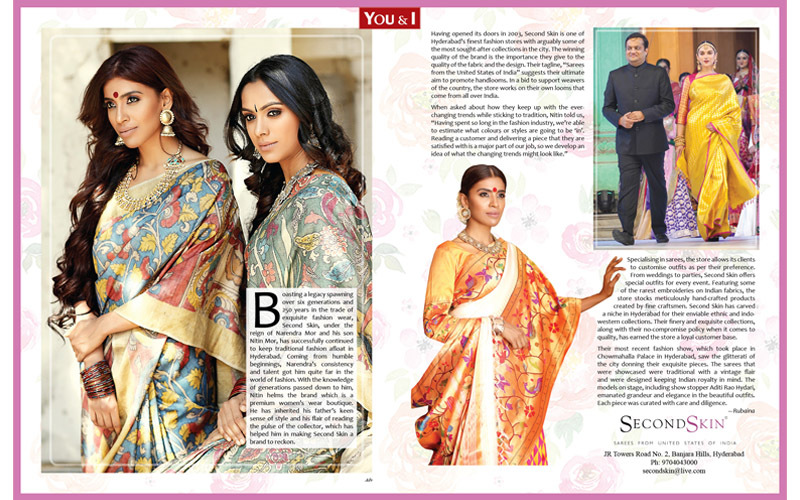 Boasting a legacy spawning over six generations and 250 years in the trade of exquisite fashion wear, Second Skin, under the reign of Narendra Mor and his son Nitin Mor, has successfully continued to keep traditional fashion afloat in Hyderabad. Coming from humble beginnings, Narendra’s consistency and talent got him quite far in the world of fashion. With the knowledge of generations passed down to him, Nitin helms the brand which is a premium women’s wear boutique. He has inherited his father’s keen sense of style and his flair of reading the pulse of the collector, which has helped him in making Second Skin a brand to reckon. Having opened its doors in 2003, Second Skin is one of Hyderabad’s finest fashion stores with arguably some of the most sought-after collections in the city. The winning quality of the brand is the importance they give to the quality of the fabric and the design. Their tagline, “Sarees from the United States of India” suggests their ultimate aim to promote handlooms. In a bid to support weavers of the country, the store works on their own looms that come from all over India. Specialising in sarees, the store allows its clients to customise outfits as per their preference. From weddings to parties, Second Skin offers special outfits for every event. Featuring some of the rarest embroideries on Indian fabrics, the store stocks meticulously hand-crafted products created by fine craftsmen. Second Skin has carved a niche in Hyderabad for their enviable ethnic and indo-western collections. Their finery and exquisite collections, along with their no-compromise policy when it comes to quality, has earned the store a loyal customer base. Their most recent fashion show, which took place in Chowmahalla Palace in Hyderabad, saw the glitterati of the city donning their exquisite pieces. The sarees that were showcased were traditional with a vintage flair and were designed keeping Indian royalty in mind. The models on stage, including show stopper Aditi Rao Hydari, emanated grandeur and elegance in the beautiful outfits. Each piece was curated with care and diligence.